This adorable flag is only 6" wide and 4" tall, but it looks great on desks. The edges are hemmed and sewn to resist fraying. They are 100% American Made, too. Try finding something else this cheap that is American Made today! Show your support for your state! There are 13 rays on the flag. Each ray is for one of the thirteen colonies. Some sources state that they also represent the thirteen counties accounted for at the time Arizona was admitted to the union. The alternating red and yellow are taken from the Conquistadors. The five pointed copper star is symbolic of the role copper plays in Arizona's economy. Each point is one of the five C's: Copper, Cattle, Citrus, Cotton, and Climate. The flag was designed by Colonel Charles Harris between 1910 and 1911. Then head of what became the Arizona National Guard, the flag was carried by the rifle team to the match at Camp Perry. Prior to that time, the Arizona Territorial Team did not carry a flag. 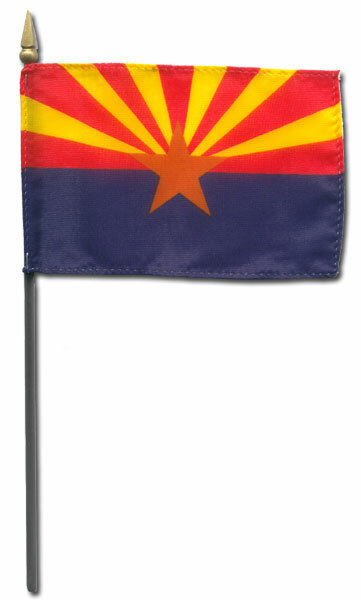 The flag was officially adopted in 1917 by the Third Arizona Legislature. Governor Campbell did not sign the bill. Oddly enough, state statute does not designate a specific shade for the copper star.